We love our dogs and thus we hate to see them in trouble and pain. Often, due to some unavoidable circumstances, our dogs are forced to fight with incapability of walking with the help of their rear limbs. 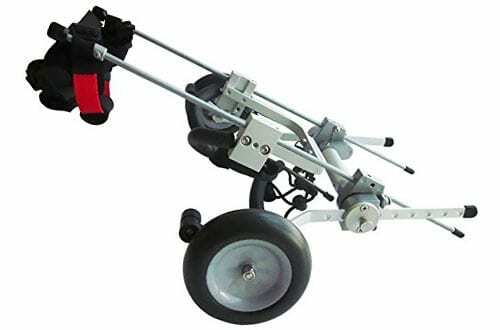 To make things easier for you and your dogs, many companies are dedicating their time to producing wheelchairs designed for dogs, so that they can move without a doubt or trouble. 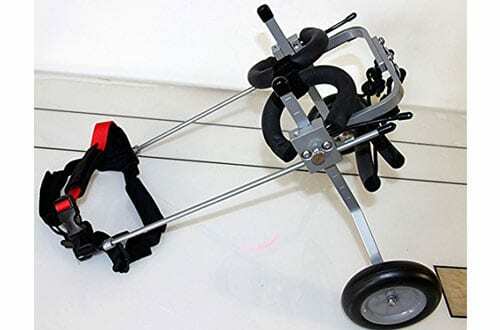 The dog wheelchairs featured in this article have been carefully studied and narrowed down on the basis of their workability, functionality, trust and even durability. 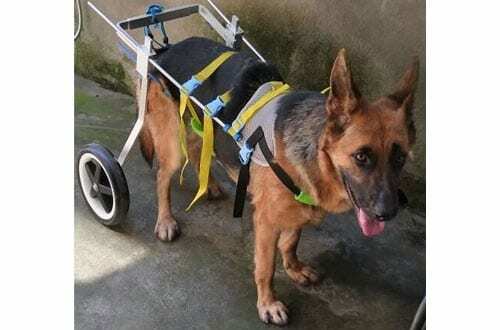 Your dog deserves the best of attention, so if you are in doubt about the right model of a wheelchair, this article will certainly help you decide. Give it a read to know more. 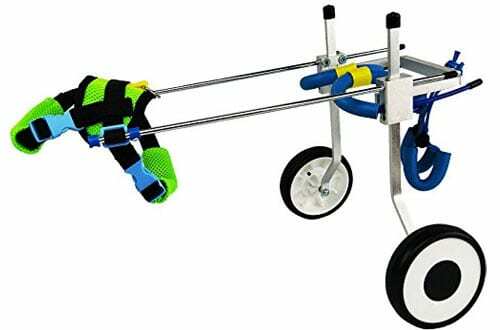 Understanding the need for every other dog is very important, so the small wheelchair set from Best Friend Mobility is combined with all the great features needed for the smooth movement of your awesome friend. Designed by orthopaedics, the wheelchair rewards you with top-notch flexibility as it comes in as many as 5 sizes while each offers you the benefit of adjustment in all directions. The various adjustable parts ensure your dog gets the best of comfort and meet the needs as well. Can support pets of weight 5 to 175 lbs. It is always disheartening to see your dog suffering from an unfortunate disease that takes away his ability to walk and jump around the house. 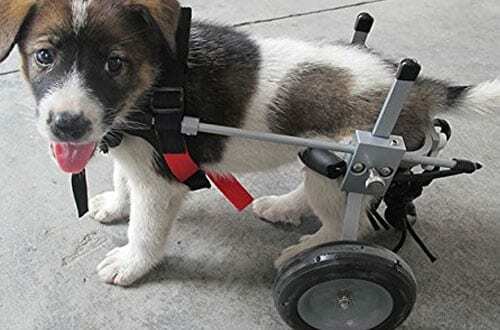 It becomes equally disturbing for your furry friend as well, so adapting to a dog based wheelchair for everyday movement is way better than the unwanted suffering. Newlife Mobility features this amazing dog wheelchair that is available in a lot of different sizes and comes with quite impressive features. From being durable to height and width adjustable, this can do all without spending a sweat. Lightweight aluminium frame ensures durability and comfort. Push button feature for height and width adjustment. Yet another cleverly designed dog wheelchair from the house of Newlife Mobility, this one is primarily dedicated to the big boys. 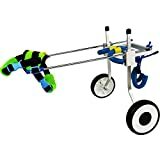 The wheelchair is finished off with great looks and is equally smart with all the little features that will help in the unrestricted fun for your dog. A dog of any height between 20” to 26” and weighing between 60 to 100 pounds can use this for the rehabilitation of the hind legs. If you do not wish to see your friend suffer or limp, this one is just the right choice. Comes with an adjustable harness for optimal comfort and mobility. Both lightweight and durable owing to the aluminium frame construction. So the little wonder is going through some trouble of walking and running around? Check out this dog wheelchair from the reliable name – Newlife Mobility that assures you of top-notch hind leg rehabilitation of your little friend in an amazing way. Not only it will light up your dog’s heart by allowing it to walk, but it will also make you feel much better to not see your dog limp every now and then. 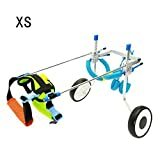 This small size is specifically designed for the small dog breeds and can work amazingly well with dogs weighing a max of 20 pounds. Designed for dogs of height between 9” and 14”. Adjustable harness rewards your dog with the best of comfort and mobility. Extremely durable and light in weight. Features push-button adjustability. Designed by the best of orthopaedic surgeons, the Elite dog wheelchair has compatibility of a whole new order. These were designed keeping in mind the behavioural differences between different dogs, the different mannerism and even the different needs of each dog. Furthermore, it allows you to adjust in every direction like height, width, and even the length. 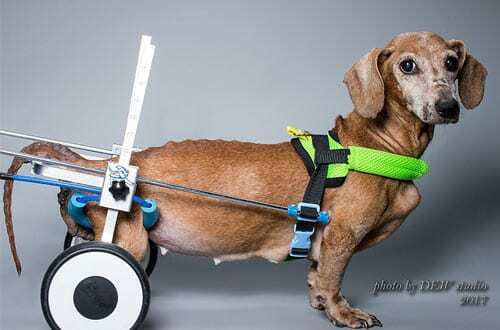 Impaired mobility will never be a saddening cause anymore with this dog wheelchair. The aluminium frame used in the construction is surprisingly durable while being lightweight. Fits for a wide range of dogs, between 5 pounds to 175 pounds of weight. Comes with neoprene front combined with harness in the rear for top-notch comfort. Best Friend Mobility has been producing some of the best dog wheelchairs in the market and this is yet another brilliant addition to their list, a medium sized wheelchair for your tender furry friend. It fits almost all medium sized dogs ranging between the heights of 16” to 20” and rewards your dog with utmost comfort and joy. If your dog weighs between 40 pounds to 60 pounds, this can be one of the best choices for your baby. Exciting features like the 8” polyurethane wheels and padded shoulder support make it even more comfortable. Features double thronged neoprene adjustable harness for the shoulders. Adjustable double padded harness for the rear. Designed for both female and male dogs. Successfully tested by the trustworthy K9 orthopaedic surgeon. Designed primarily for dogs that have short legs and a long body, like corgis and dachshunds, the Newlife Mobility dog wheelchair will help in attaining a constriction-free movement for your dog every single time. Any height between 7.5” to 14” and any weight between 8.8 pounds to 26.5 pounds can fit right in the wheelchair. Also, the wheelchair features a push button for the right adjusting of the height, length and width, thus optimum comfort every single time. The beautiful leash comes along with the chair and looks amazing as well. Comes with soft when comes in contact with skin and comfortable 3D harness. Features a belly band for utmost protection of spine. Made out of a durable and lightweight aluminium frame. If you want to gift your dog the freedom of movement and running around even when he is having troubling rear limbs, this dog wheelchair for small dogs from the trustworthy brand Best Friend Mobility is certainly a fascinating choice. 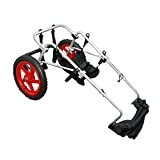 It comes with a number of impressive features like non-rust stainless construction, a hassle-free hex wrench adjustment for height, length as well as width, deluxe neoprene harness in both front and rear for the best of comfort. And even an easy clip-on harness system in the front. Trust of the K9 orthopaedic surgeons. Both lightweight and adjustable aluminium frame. Polyurethane wheels with bearing support for all types of terrain. The amazing design of Newlife Mobility’s dog wheelchair is quite impressive in all directions while the exciting features are sure to win your heart every single time. This specific product is fit for dogs between 7.5” to 14” in height and comes with all the right features for a comfortable ride for your dog. 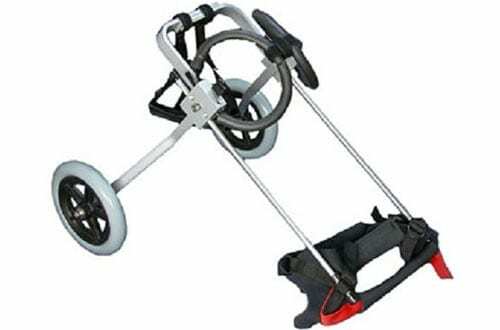 The lightweight aluminium frame makes movement easier while the adjustable harness assures great comfort and mobility. Furthermore, it comes with a push button for adjusting of height, width and length. Comes with a belly band for safeguarding the spine. Features a soft 3D comfortable harness. 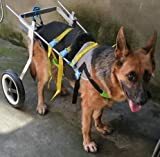 At the very top of the list, this is a dog wheelchair that has won the trust of veterinarians owing to its very smart and advanced features, assuring the best of comfort and mobility for your medium sized dogs. The adjustable and lightweight aluminium frame allows your dog to be stable while manoeuvring. Even if your dog has limited or no mobility in his hind limbs, this will still work fantastically well. 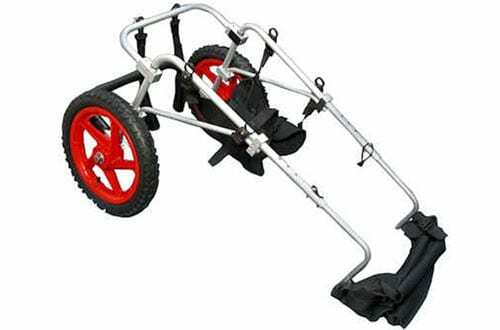 Features dense foam wheels combined with rubber treads for all terrain, risk-free movement. Fully adjustable harness for optimal comfort and mobility. Accommodates dogs of 26 to 49 pounds. 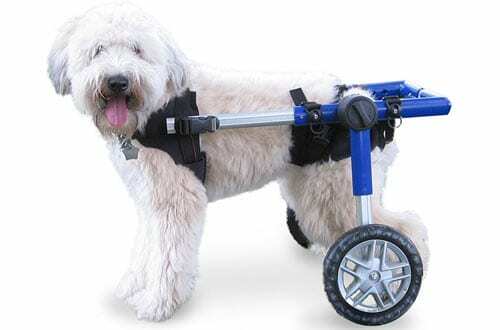 Give your little friend a reason a run and move around by gifting them one of these excellent dog wheelchairs. It’s worth buying!